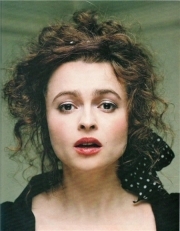 Helena Bonham Carter, CBE is an English actress of film, stage, and television. She made her acting debut in a television adaptation of K. M. Peyton's A Pattern of Roses before winning her first film role as the titular character in Lady Jane. She is known for her roles in films such as A Room with a View, Fight Club, and the Harry Potter series, as well as for frequently collaborating with director and domestic partner Tim Burton in films such as Planet of the Apes, Big Fish, Corpse Bride, Charlie and the Chocolate Factory, Sweeney Todd: The Demon Barber of Fleet Street, Alice in Wonderland and the upcoming Dark Shadows. A two-time Academy Award nominee for her performances in The Wings of the Dove and The King's Speech, Bonham Carter's acting has been further recognised with six Golden Globe nominations, an International Emmy Award, a BAFTA Award, and a Screen Actors Guild Award. She was appointed Commander of the Order of the British Empire in the 2012 New Year Honours for services to drama. Bonham Carter has not received any formal training in acting. In 1979, she won a national writing contest and used the money to pay for her entry into the actors directory Spotlight. She made her professional acting début at the age of 16 in a television commercial. She also had a part in a minor TV film A Pattern of Roses. Her first starring film role was as Lady Jane Grey in Lady Jane , which was given mixed reviews by critics. Her breakthrough role was Lucy Honeychurch in A Room with a View, which was filmed after Lady Jane, but released beforehand. Bonham Carter also appeared in episodes of Miami Vice as Don Johnson's love interest during the 1986–87 season and then, in 1987 opposite Dirk Bogarde in The Vision and Stewart Granger in A Hazard of Hearts. Bonham Carter was originally cast in the role of Bess McNeill in Breaking the Waves, but backed out during production due to, "...the character's painful psychic and physical exposure," according to Roger Ebert. The role went to Emily Watson, who was nominated for an Academy Award for the role. In 1994, Bonham Carter appeared in a dream sequence during the second season of the British comedy series Absolutely Fabulous, playing Edina Monsoon's daughter Saffron. Throughout the series, references to physical similarities between Bonham Carter and the character of Saffron had been made. These early films led to her to being typecast as a "corset queen", and "English rose", playing pre- and early 20th century characters, particularly in Merchant-Ivory films. She played Olivia in Trevor Nunn's film version of Twelfth Night in 1996. One of the high points of her early career was her performance as the scheming Kate Croy in the 1997 film adaption of Wings of the Dove which was highly acclaimed internationally and it netted her first Golden Globe and Academy Award nomimations. She has since expanded her range, with her more recent films being Fight Club, Wallace & Gromit: The Curse of the Were-Rabbit, and Tim Burton's Charlie and the Chocolate Factory, Corpse Bride, Big Fish, Sweeney Todd: The Demon Barber of Fleet Street and Alice in Wonderland. Bonham Carter speaks French fluently, starring in a 1996 French film Portraits chinois. In August 2001, she was featured in Maxim. She played her second Queen of England when she was cast as Anne Boleyn in the ITV1 mini-series Henry VIII; however her role was restricted, as she was pregnant with her first child at the time of filming. Bonham Carter was a member of the 2006 Cannes Film Festival jury that unanimously selected The Wind That Shakes the Barley as best film. Bonham Carter played Bellatrix Lestrange in 2007's Harry Potter and the Order of the Phoenix, 2009's Harry Potter and the Half-Blood Prince, 2010's Harry Potter and the Deathly Hallows – Part 1, and 2011's Harry Potter and the Deathly Hallows – Part 2. Bonham Carter received positive reviews as Lestrange, described as a "shining but underused talent". She then played Mrs. Lovett, Sweeney Todd's amorous accomplice in the film adaptation of Stephen Sondheim's Broadway musical, Sweeney Todd, the Demon Barber of Fleet Street. The film was released on 21 December 2007 in the US and 25 January 2008 in the UK. Directed by Tim Burton, Bonham Carter received a nomination for the Golden Globe for Best Actress for her performance. She won the Best Actress award in the 2007 Evening Standard British Film Awards for her performances in Sweeney Todd and Conversations With Other Women, along with another Best Actress award at the 2009 Empire Awards. Bonham Carter also appeared in the fourth Terminator film entitled Terminator Salvation, playing a small but pivotal role. In May 2006, Bonham Carter launched her own fashion line, "The Pantaloonies", with swimwear designer Samantha Sage. Their first collection, called Bloomin' Bloomers, is a Victorian style selection of camisoles, mop caps and bloomers. The duo are now working on Pantaloonies customised jeans, which Bonham Carter describes as "a kind of scrapbook on the bum". Bonham Carter joined the cast of partner Tim Burton's 2010 film, Alice in Wonderland as The Red Queen. Bonham Carter appears alongside Johnny Depp, Anne Hathaway, Mia Wasikowska, Christopher Lee and Alan Rickman. Bonham Carter's role was an amalgamation of two roles, The Queen of Hearts, and The Red Queen. In early 2009, Bonham Carter was named one of The Times newspaper's top 10 British Actresses of all time. Bonham Carter appeared on the list with fellow actresses Julie Andrews, Helen Mirren, Maggie Smith, Judi Dench and Audrey Hepburn. In 2010, Bonham Carter played Elizabeth Bowes-Lyon in the film The King's Speech. As of January 2011, Bonham Carter had received numerous plaudits for her performance, including nominations for the BAFTA Award for Best Actress in a Supporting Role and the Academy Award for Best Supporting Actress. Bonham Carter won her first BAFTA Award, but lost the Academy Award to Melissa Leo for The Fighter. Bonham Carter signed to play author Enid Blyton in the BBC Four television biopic, Enid. It was the first depiction of Blyton's life on the screen, and Bonham Carter starred with Matthew Macfadyen and Denis Lawson. Bonham Carter also received her first Television BAFTA Nomination for Best Actress, for Enid. In 2010, she starred with Freddie Highmore in the Nigel Slater biopic Toast, which was filmed in the West Midlands and received a gala at the 2011 Berlin Film Festival. She has now been confirmed to be taking on the role of Miss Havisham in Mike Newell's adaptation of the Charles Dickens novel, Great Expectations. She received the Britannia Award for British Artist of the Year from BAFTA LA in November 2011. In mid-2011, Bonham Carter was reported to be in negotiations to star in a film adaptation of the musical Les Misérables, playing the role of Madame Thénardier. Her role was later confirmed on September 8, 2011. In 2001, Bonham Carter began her current relationship with director Tim Burton, whom she met while filming Planet of the Apes. Burton has taken to casting Bonham Carter in his movies, including Big Fish, Corpse Bride, Charlie and the Chocolate Factory, Sweeney Todd: The Demon Barber of Fleet Street, and Alice in Wonderland. They live in Belsize Park, London, in neighbouring houses with a connecting doorway because they both agreed that they needed their own personal space, and though living next door to each other, they still have a happy and healthy loving relationship. Bonham Carter owned one of the houses, Burton later purchased the other and they then connected the two. Their son Billy Raymond Burton was born on 4 October 2003. At age 41, she gave birth to her second child, a daughter named Nell Burton, on 15 December 2007 in Central London. She says she named her daughter Nell after all the "Helens" in her family. In August 2008, four of her relatives were killed in a safari bus crash in South Africa, and she was given indefinite leave from filming Terminator Salvation, returning later to complete filming. In 2008, Bonham Carter and Burton sold their American apartments for $8.75 million. In early October 2008, it was reported that Bonham Carter had become a patron of the charity Action Duchenne, the national charity established to support parents and sufferers of Duchenne muscular dystrophy. Bonham Carter is known for her unconventional sense of fashion, which has been described as "shabby chic". Despite her often controversial fashion choices, Vanity Fair named her on its 2010 Best-Dressed List and she was selected by Marc Jacobs to be the face of his autumn/winter 2011 advertising campaign. She cites Vivienne Westwood and Marie Antoinette as her main style influences. Whole or part of the information contained in this card come from the Wikipedia article "Helena Bonham Carter", licensed under CC-BY-SA full list of contributors here.